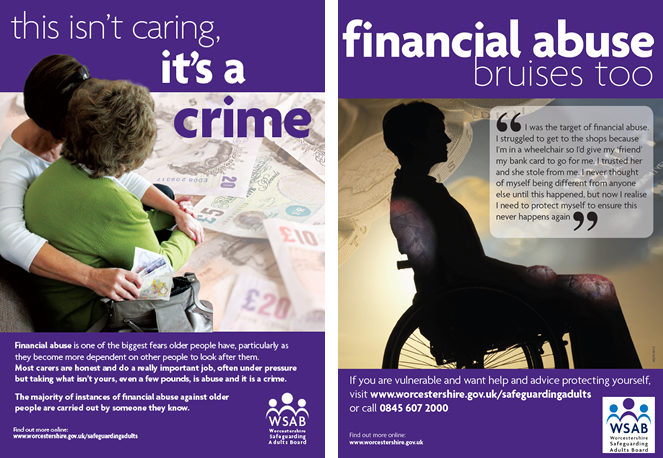 The above awareness posters come from the Worcestershire County Council in the UK. See more of their resources for the elderly here. A person's possessions being sold or disappearing. An unexplained inability to pay bills or a shortage in money. A withdrawal from family or friends and social network and seemingly self isolation. A carer’s or family member’s lifestyle becoming enhanced. Abrupt changes in a Will or financial documents. Signatures on cheques etc., that do not resemble the adult at risk's signature, or signed when the adult at risk cannot write. Sudden changes in bank accounts, including unexplained withdrawals of large sums of money. The inclusion of additional names on an adult at risk's bank account. Abrupt changes to, or the sudden establishment of, wills. The sudden appearance of previously uninvolved relatives claiming their rights to an adult at risk's affairs or possessions. The unexplained sudden transfer of assets to a family member or someone outside the family. Numerous unpaid bills, or overdue rent, when someone else is supposed to be paying the bills. Unusual concern by someone that an excessive amount of money is being expended on the care of the adult at risk. Lack of amenities, such as TV, personal grooming items, appropriate clothing, that the adult at risk should be able to afford. The unexplained disappearance of funds or valuable possessions such as art, silverware, or jewellery. Deliberate isolation of an adult from friends and family, resulting in the caregiver alone having total control. The rampant unchecked plundering of Dolores Maxwell's purse did not end with her death, in spite of numerous warnings to Dolores' solicitor and evidence being provided of financial irregularities in the administration of Dolores' estate. With Beauchamps refusing to respond to beneficiaries' requests for answers and information, and mindful that each partner in Beauchamps Solicitors is responsible for all that happens in the firm, Saoirse wrote to each and every one of the twenty-three partners in the firm on 24 May 2013. 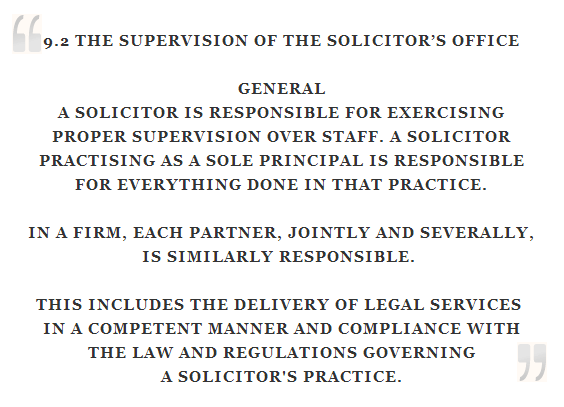 I am informed by the Law Society that in a firm like Beauchamps, each and every partner is individually responsible for everything that happens in the practice. With that in mind, I am informing you and the rest of the partners at Beauchamps of very troubling and serious issues in your Private Clients section. I am the eldest daughter of Dolores Maxwell. Beauchamps has represented members of the Maxwell family for decades, including my Mom and Dad, my uncle Patrick Maxwell, and my Grandfather. Mom died in November, 2010. John Cunningham and Joseph Bowe are named as solicitor/executors; my youngest brother Ethan Maxwell is the third executor. A Grant of Probate was issued in May of 2011, and Mom’s last asset, her house, was sold in July of 2012. Charges are lodged against my mother’s estate for thousands of Euros, assigned to a company that adamantly and clearly state in both correspondence and personal interview that they have never lodged an invoice of any kind to my Mom’s estate. They have never been contracted to do any work, asked to do any work, and have never agreed to do any work either for Mom or her estate. The only contact they have had with the executors was to prepare a quotation at one of the executor’s request. These charges seem to have been paid out to somebody. The executors have known about this for well over a year, and refuse to provide any explanation to the beneficiaries of Mom’s estate, despite being asked many times over the last year. In fact when I initially alerted Mr. Bowe to this issue, he responded by informing me he would no longer respond to my correspondence. My brother Sean was also informed by Mr. Bowe that he will no longer respond to his emails after Sean sought some clarity regarding the administration of Mom’s estate. The solicitor/executors have stopped taking calls, returning calls or answering correspondence. There are omissions of hundreds of thousands of Euros on the Revenue CA24 form the executors prepared for the Grant of Probate. The executors were well aware of these omissions. Your employees, Mr Bowe and Mr Cunningham demonstrably perjured themselves. My latest check with the Probate Office reveals no corrected affidavit has been filed. An example of one of these omissions comes from 2005. Mr. Bowe describes it as a “gift” from his clients Dolores and Cecil Maxwell (my parents) to his client Ethan Maxwell. Mr. Bowe acted for both sides in this transaction even though (by his own admission) he was informed by three separate parties that his clients Dolores and Cecil were acting under extreme duress and undue influence from his client Ethan Maxwell. I wrote to Beauchamps’ Managing Partner, John White in January of this year, informing him of these and many, many more issues concerning the administration of Mom’s estate and Beauchamps’ representation of my Mom, Dad, and my uncle Patrick Maxwell by Mr. Bowe. John White did not offer a response. Since then, more disheartening documents have surfaced indicating that at least one of the executors is using Mom’s estate to pay his personal liabilities. Furthermore, other evidence has come to light showing Mom’s estate being charged for items that Mom already paid for (or was forced to pay for) months before she died. Indicative of the level of “professional service” Mom received from Beauchamps, in my view, is seen in the attached medical certificate which was part of Mom’s Enduring Power of Attorney prepared for her by Beauchamps. Three times physicians’ names are entered and then scratched out on this very important document. 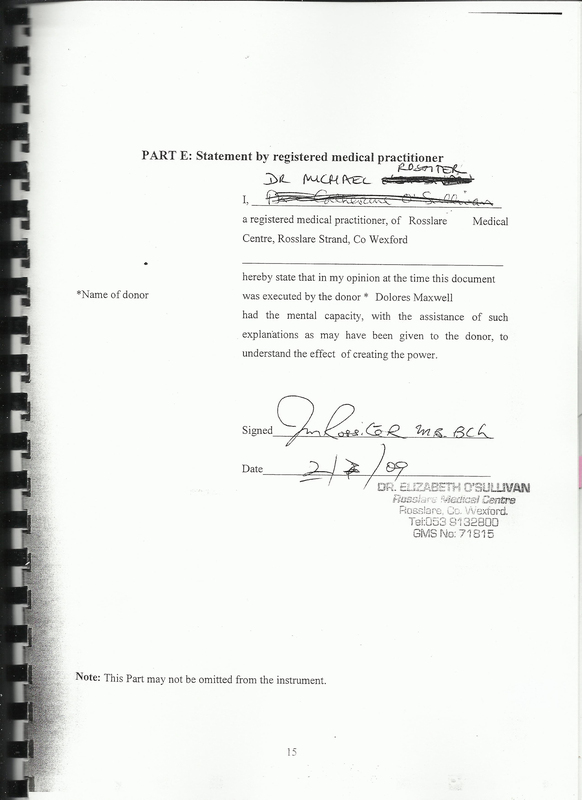 The name finally entered as the signatory, as written, is unknown to the Medical Council of Ireland. Nor does that name appear in any of Mom’s medical records. My mother appointed Joseph Bowe as the sole attorney named in her EPA. She trusted Beauchamps fully to take care of her person and her purse if it ever became necessary. My mother expected, deserved and paid for an EPA she could trust. Ms Reynolds, have you ever prepared or accepted a contract with names scratched out like this? Would you consider your mother well served with such a document? Describing Mr Bowe’s acceptance of this document as professional negligence is being kind. Perhaps it explains Mr Bowe’s apparent reluctance to register Mom’s EPA when it was sorely needed to protect her in the hospital. Mr Bowe was fully aware that at least three different witnesses had reported that Mr Bowe’s client Dolores Maxwell was being physically and verbally abused in her hospital bed by Mr Bowe’s client Ethan Maxwell, yet no EPA was ever registered. Of course how could it possibly be registered with that medical cert? I note Mr Bowe in 2006 had aided and encouraged his client Ethan Maxwell to seek a Ward of Court for my elderly uncle Patrick Maxwell – despite the fact that Patrick’s two brothers were willing and able to do this and were named as executors in Patrick’s will. I have to wonder if such a thing would have happened to Mom if she hadn’t died. Ms Reynolds, I have attached a letter that Mr Bowe assures me was issued from Beauchamps. He declines to reveal who the author was and on whose instructions it was written. It is a letter dated 13 September 2010 to my brother Conor Maxwell. This letter was sent following unsuccessful attempts by Conor and his family to visit Mom. I note that it was Mr Bowe’s client Ethan Maxwell who prevented Mom from seeing her children and grandchildren. Do you have any knowledge of this letter? I have grave concerns about this given Mr Bowe’s tacit admission that he was in receipt of instructions from his client Ethan Maxwell concerning the affairs of his client Dolores Maxwell. Documents in my possession strongly suggest that Mr Bowe acted on these instructions to the great detriment of my mother, his client Dolores Maxwell. I have also attached for your reference my letter to Managing Partner John White dated 02 January, 2013. I refer you to the website Dolores-Maxwell.com for more background on the issues brought to Mr White’s attention. This provides a brief snapshot of the tip of an iceberg. Everything I bring to your attention here – and much, much more that I have not - is supported by documentary evidence and/or audio recordings. I hope you take some offense at these things taking place under your roof and on your watch. Bearing in mind once again the Law Society’s view, please tell me what actions you as a directly responsible partner plan to take to protect and make whole Mom’s estate, and bring accountability to those involved. I expect this letter to reach you on Monday the 27th. I am copying this letter in an email to you. This letter has also been provided to Dolores-Maxwell.com.